German troops invade Denmark and Norway simultaneously. There is very little opposition by the surprised Danes, with Copenhagen being captured within 12 hours. The Germans make sea-borne landings in Norway at Oslo, Kristiansand, Bergen, Trondheim and Narvik. An airborne landing is also made against the airfield at Stavanger. Norwegian defenders move inland. Major Quisling sets up ‘National Government’ in Oslo. The Kriegsmarine loses the cruisers Blacher, which is sunk by Norwegian coastal batteries, plus Koenigsberg and Karlsruhe to British naval and air attack. German forces capture Nis and Monastir in Yugoslavia. German tanks enter Thessalonika, trapping the Greek 2nd Army in the Metaxas line, forcing them to surrender. 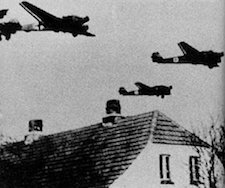 The RAF attack Kiel in an attempt to knock out the port facilities. The Germans make some limited advances towards their surrounded units at Kholm-Staraya Russa. Russian troops attack furiously at Kerch in the Crimea, but there have no success because of the stubborn German defense. Mahatma Gandhi arrested in India. US-Filipino forces on Bataan Peninsula in the Philippines surrender. 78,000 troops are captured, including 12,000 Americans, but 2,000 escape to Corregidor. This is the largest capitulation in US History. Japanese aircraft sink the British carrier Hermes, the destroyer Vampire and three other warships in Indian Ocean. Exterminations at Chelmno cease. The camp will be reactivated in the spring of 1944 to liquidate ghettos. In all, Chelmno will total 300,000 deaths. The remains of the 1st Panzer Army regain the German lines after a 150-mile forced march. The Red Army breaks through the German lines at Kerch in the eastern Crimea. Fierce fighting across the District Commissioner’s tennis court at Kohima. The Japanese renew their struggle with the 17th Indian Division, South West of Imphal. The British Eighth Army launches its final offensive in Italy with a 1,800-plane and 1,500-gun bombardment of the German positions East of Bologna. The U.S. Fifth Army begins its offensive toward Bologna and the Po river valley. Army Group E is now completely isolated from the main German forces, but continues its struggle against Tito’s partisan forces in Yugoslavia. Russians secure Koenigsberg, after the commander of “fortress Koenigsberg” General Lasch surrenders.